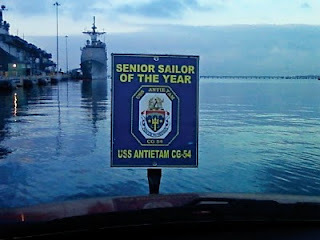 I am thankful for being selected as the USS Antietam Senior Sailor of the Year for 2009. I waited quite a while to announce this because the award wasn't finalized yet. However, a letter came a few days ago letting Alicia know how proud she should be of me, so I guess it's ok to announce it. I am grateful for being selected as I didn't expect it. While I knew that I was being put in for the award, I knew there were other guys who frankly did more this year. God has been gracious to me through this, however, by giving me this wonderful reminder of how big he is. Thank you, Father! May you and your family be richly blessed in the new year. And yours too! God is good indeed! 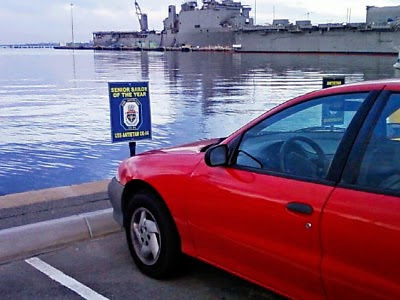 GREAT a private parking spot ON the pier? That's worth a little sweat. I know! I'm not letting it go to my head, but wow...it's so fun to see that sign when I park!